It is not everyday that my Dividend Stock Tracker, tracking popular Singapore High Yielding Stocks showed severe negative prices. And that includes my experience in 2007-2008. There would always be some stocks that are positive or no change. This is unprecedented. While we do not know the main reason, Japan 10 year bond yields edge above 1%. That psychological point could mean that higher borrowing costs are coming in the near future. As a result the carry trade (which I thought was pretty dead) hit a snag. 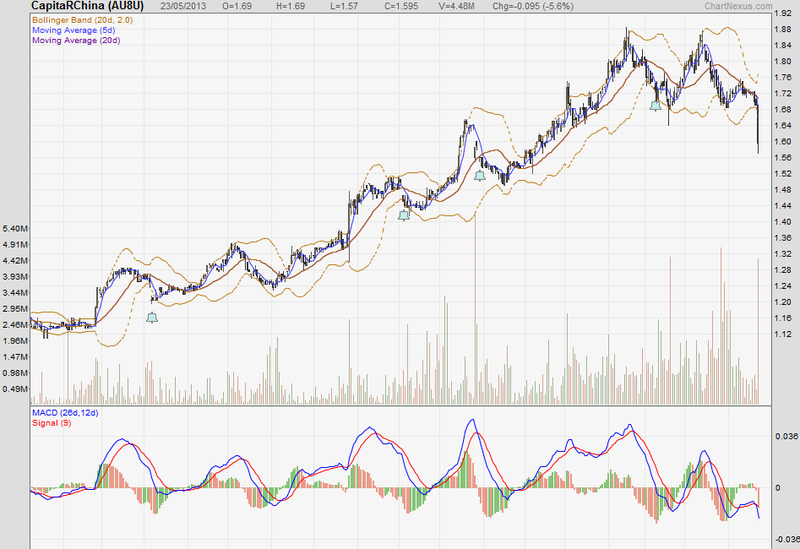 While volume is not as high as the rest, it is still startling to see a 1 day 5% drop in a long time. My recent hypothesis is that this rally have all been a case of yield compression. Hot money search for higher yields at higher risk assets. This movement shows how a large part of the shares look to be in speculative holdings. 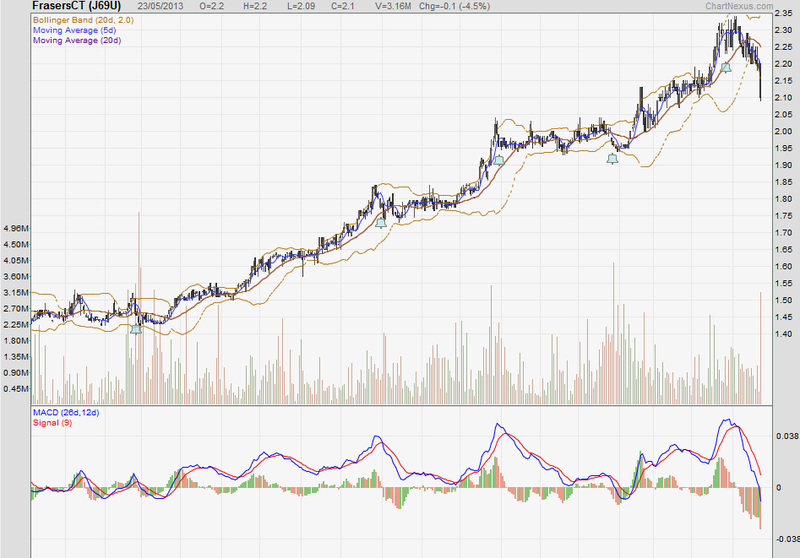 At one point it went all the way back by 20 cent which is like a 25% fall. Fat fingers? Volume is high. I got to be honest I wanted to punt this stock. Fortunately I didn’t. Else I would have been caught in this. One of the stocks shown here with a double top. Price target $1.44? 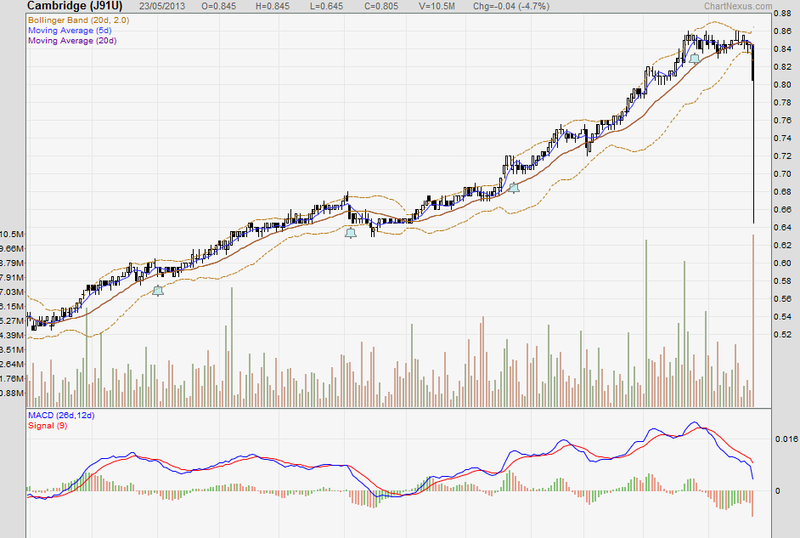 One of the stocks that I missed, which I really should do it at $1. Perhaps rather good management and a 6.2% yield. Gearing is high but a lot of Freehold and 999 year lease properties. Another trust from Frasers. The price is 14% above my average price. As with Frasers Commercial, these are priorities. One of the last REIT to run. Recently took a liking of its management as well as their development deal for the Equinix data center. Still the worry here is that if you read the latest quarter report for a lot of companies, they seem to be moving out of Singapore. 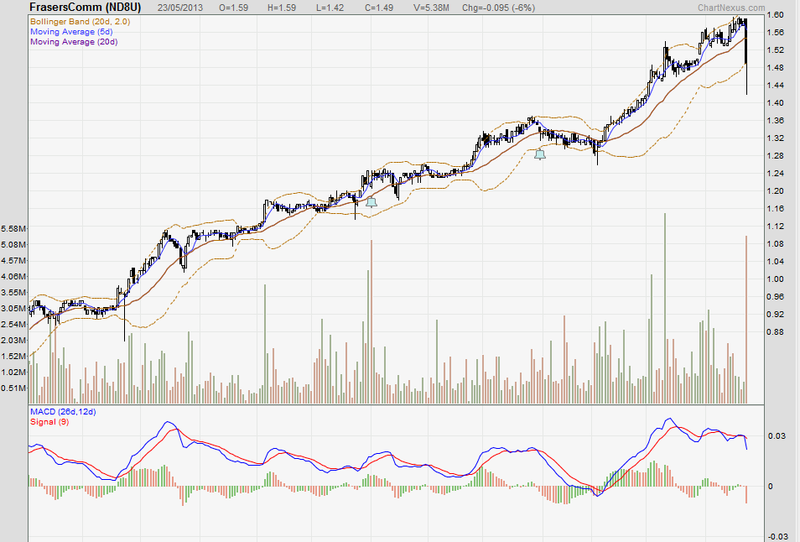 One industrial REIT with a similar profile to Aims Amp but for Sabana the volume is huge! We can’t tell if this is due to the market being temporary spooked by Fed Speak or due to what was mentioned above. If its due to the open mouth committee, then they just need the right words to set prices back. This is a non event. I notice many folks due to low fixed deposit rates decide to chase yield. If you think current price provides you a good required rate of return yet you are not overpaying for it (based on PTB, DCF) then this should be an issue. You may be stuck in this, and 2 years later you may learn the lesson that even good yielding stocks are poor investment if you pay dear for it. The important thing is to develop a much more conservative risk management and valuation determination. FREE Stock Portfolio Tracker to help track your dividend stocks by transactions to show your total returns. 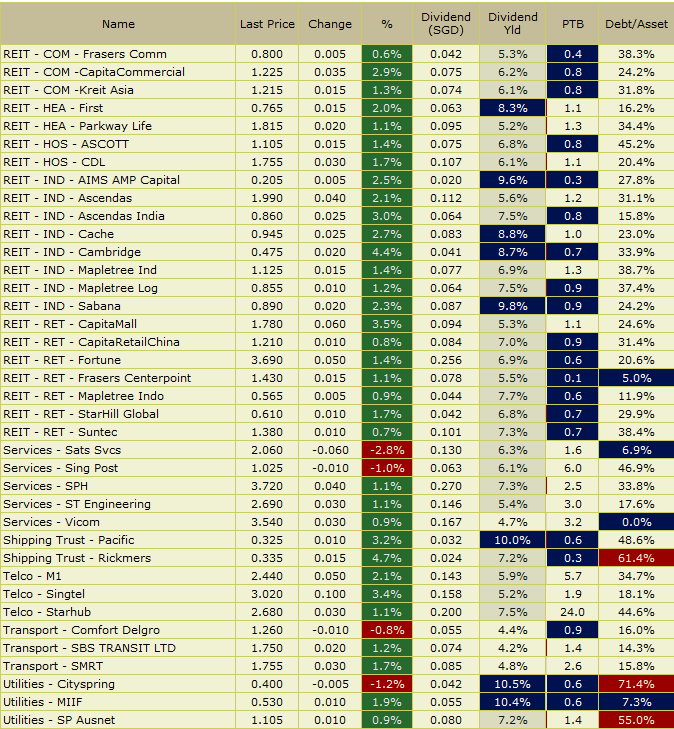 We added 3 stocks to our Dividend Stock Tracker this week. I am sure with the recent market volatility you will be interested to know whether any of your REITs being monitored have reached good valuations. We updated the dividend yields to reflect latest quarter distributions as well. The Industrial REITs still leads in terms of yield distributions, but that does not mean that they are more leverage. 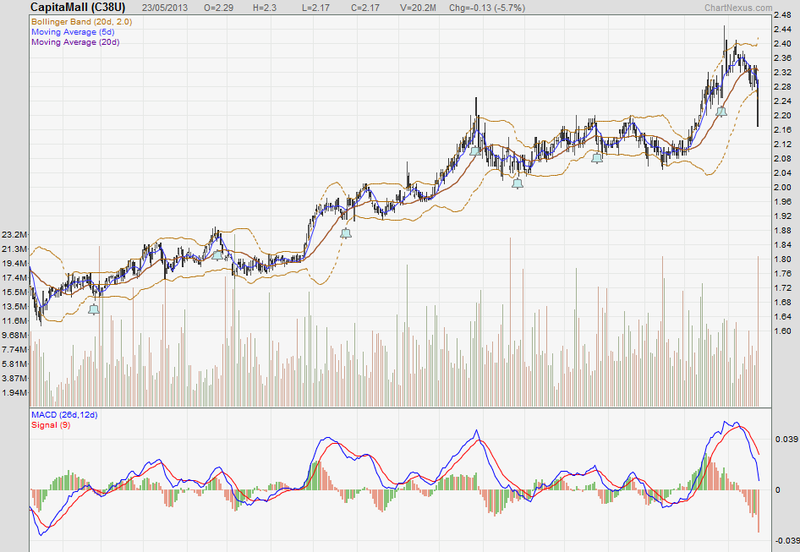 In terms of yield changes there isn’t much surprises after this 2 weeks. We will have to see if the market actually develops a bear trend to know if prices do get more attractive. Readers who have bookmarked my Dividend Stock Tracker, would have note that I categorize the REITs into the nature of the REITs. One category that is getting attention recently have been the Industrial REITs due to the IPO of Mapletree Industrial REIT. The question many are asking is how does this new REIT rank among its peers. 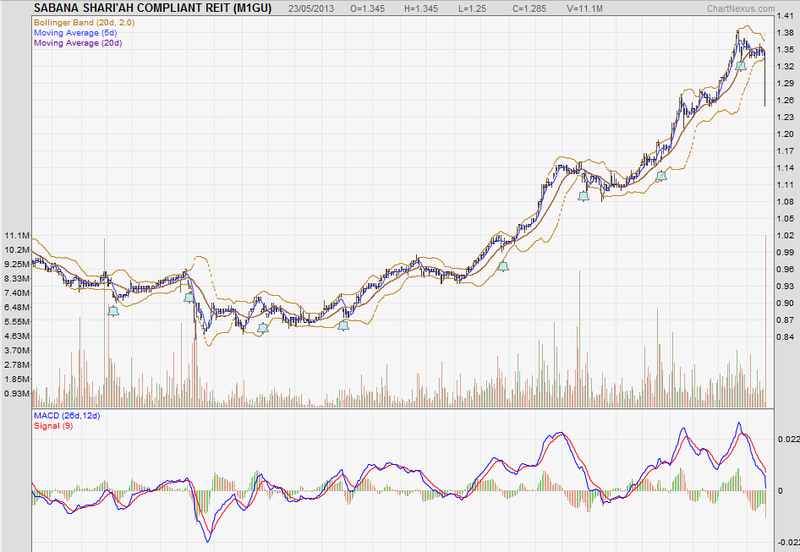 These REITs seems to behave similarily on the SGX. They are make up by former assets in large parent sponsers and have the backing of these sponsers, so they have the first right of refusal on assets. Since they are larger capitalized, institutional investor take notice of them and they are likely to trade higher to their peers in the other categories and their prices are closer to NAV or even trading above their NAV. Strong sponsers would enable them to steer better during recession or times where credit is tight. The first industrial REIT to be listed here and probably the largest in Singapore. Considered a mature REIT that doesn’t add much yield accretive assets any more and is backed by parent Ascendas. 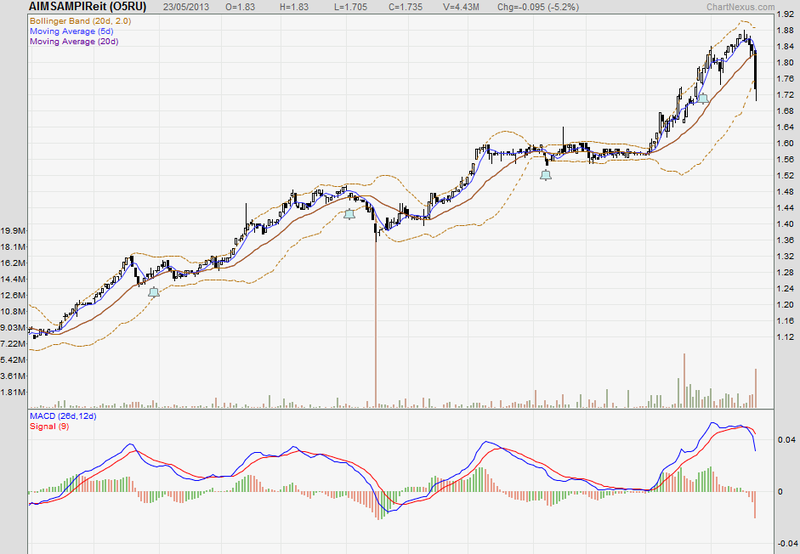 Ascendas REIT current yield is 5.1% and trading at a premium to book value. Debt to Assets is average. Spin off by sponsers Mapletree investments, this is a large logistic REIT with vast assets in Singapore and Japan in particular. Its strategy have been in acquiring overseas assets in Japan for example that are more yield accretive. Mapletree Logistics REIT current yield is 6.4% and trading at 0.7 times PTB and Debt to Assets is 32%. The latest IPO darling is smaller than its peers above but nevertheless has a strong sponser to tap. Management have indicated that they will not be acquiring anything soon. 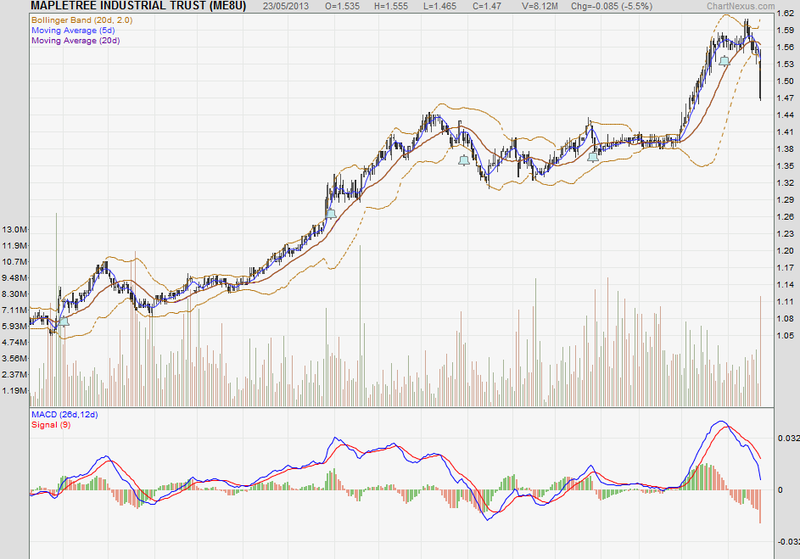 Mapletree Industrial REIT current yield is likely to be around 7.6% – 8% and trading at a premium to book value. Debt to assets eventually should be higher than 35%, indicating difficulty to leverage up further. 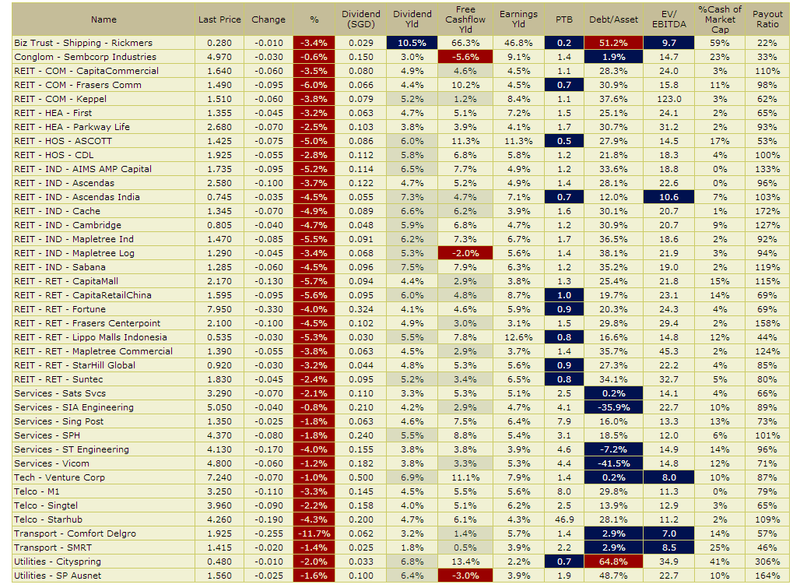 These are the “forgotten childs” or REITS that do not have a strong sponsers. This and the fact that they are smaller makes them less viable candidates for overseas funds. 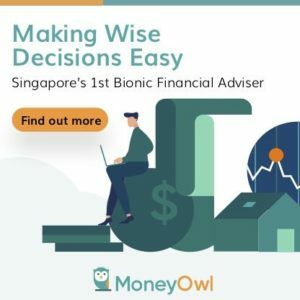 Weak sponsers also make them trade at a higher yield, indicating greater risks vs their peers and they may find difficulties when they come to finding tenants, re-financing debts and finding new yield accretive assets. Formerly known as MacArthurCook Industrial, this Australian linked REIT have much turbulence during the credit crisis in 2007-2008 where they have problems re-financing their loans. Very much indicate the problem of smaller REITs and thus yield and market valuation is reflective of this risk vs its larger peers. 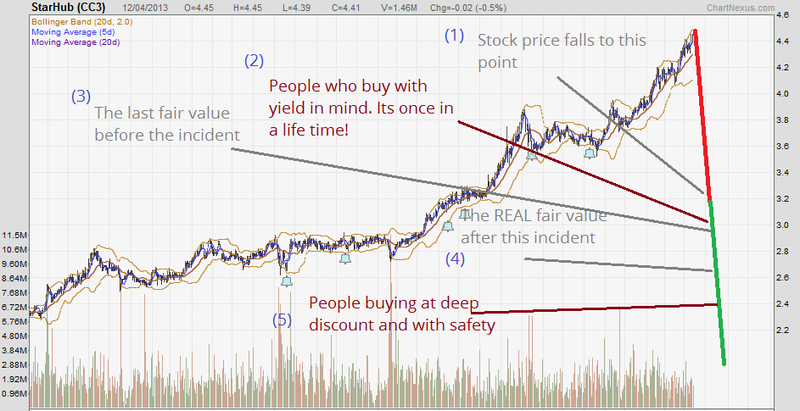 AIMS AMP Capital current yield is 9.2% and trading at 0.7 times book value and debt to assets is 25%. Probably the first independent REIT which seems to not work so well in Singapore environment. Like AIMS, had issues refinancing during the credit crisis but manage to steadied its ship. Cambridge Industrial current yield is 9.4% and trading at 0.7 times book value. A recently listed logistics trust that has a sponser in CWT a local strong logistics player. Its tenant based are multi-national companies indicating risks but as long as Singapore remains an important transportation hub in the global economy, these companies are likely to stay as long tenants. Cache Logistics Trust current yield is 7.9% and its debt to assets is 28%. Disclosure: Vested in AIMS AMP Capital and Cache Logistics Trust.